We stayed a few places in Fes during our trip and this was by far our favourite, we only wish we had more time here! The owner was very welcoming and happy to help with any general questions we had. The location is a little tricky to find as it's right in the heart of the medina but once you find your bearings it's a massive benefit. The building is also beautiful, we'd highly recommend staying here. Amazing hostel. Moussa is amazing! Extremely kind and helpful. We loved our time here and appreciated the friendly staff, location, size of the room and provided towels, and bathroom. Wonderful roof terrace as well. Breakfast was great (with a rare tea refill!) and the tea upon a return was such a treat after a long day of walking. Definitely recommend and hope to be back one day! 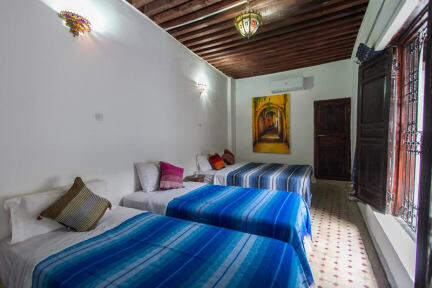 This riad has a great location in the old madina, 10 min walk from the blue gate. 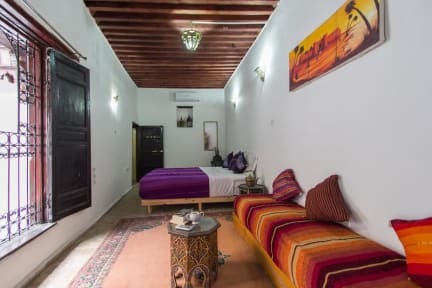 I had planned a 2 night stay in Fez but extended to 4 nights.What makes this riad a great choice is Moussa, the hostel manager, who attended to every need and ensured my visit was an enjoyable and safe one. He booked me onto a group tour to Meknes/Volubilis and even picked me up a bus ticket to Chefchaouen in advance to ensure I would get a seat. All in all, a great choice. Highly recommend!! I really liked this place. Emlilmoudy is an honest and kind man always willing to help. The staff is super nice. He gave me a single room instead of the bunkbed I had booked when I arrived because I arrived too late(midnight) and there's still a single room available. Also he's a local, so he could answer most of your questions. No heaters in the room so be prepared. The setup of the common area is not the best for socialising, but the roof top is.